Indian removal act (1830). (2015). In T. Riggs (Ed. ), The Gale encyclopedia of U.S. economic history. (2nd ed.). [Online]. Farmington: Gale. Available from: https://search.credoreference.com/content/topic/indian_removal_act_of_1830 [Accessed 26 April 2019]. "Indian Removal Act (1830)." Gale Encyclopedia of U.S. Economic History, edited by Thomas Riggs, Gale, 2nd edition, 2015. Credo Reference, https://search.credoreference.com/content/topic/indian_removal_act_of_1830. Accessed 26 Apr. 2019.
in U.S. history, law signed by President Andrew Jackson in 1830 providing for the general resettlement of Native Americans to lands W of the Mississippi River. From 1830 to 1840 approximately 60,000 Native Americans were forced to migrate. Of some 11,500 Cherokees moved in 1838, about 4,000 died along the way. The Indian Removal Act of 1830, passed by Congress on May 26, 1830, empowered President Andrew Jackson (in office 1829–37) to exchange Native American tribal land east of the Mississippi River for land west of the Mississippi River without tribal agreement. Prompted by the desire of white settlers to gain access to Native American land in the Southeast, the Indian Removal Act effectively legalized a land grab by white settlers in the present-day states of Alabama and Mississippi. The act also nullified Native American claims to land ownership and economic sovereignty within U.S. territory, and it resulted in the forced western migration of thousands of Native Americans to unsettled lands that the United States acquired from France in the Louisiana Purchase of 1803. While the U.S. government financially compensated the relocated tribes for the loss of their historical lands, the forced move had devastating economic and social consequences for the relocated tribes, including massive loss of property, traditional cultural practices, and life. Although the forced removal of Native Americans had been considered and rejected under the earlier U.S. presidencies of Thomas Jefferson (in office 1801–09) and James Monroe (in office 1817–25), the Indian Removal Act was championed by President Jackson, who argued that the act would protect Native American tribes from the negative influences of white culture. Jackson had long been a proponent of Native American tribal removal from the United States, dating back to his military career, when he defeated the Creek Indians in the Battle of Horse Shoe Bend in 1814 and forced the tribe to cede much of present-day Alabama and Georgia. Jackson later negotiated 9 of the 11 major Native American removal treaties in U.S. history and oversaw the removal of nearly 50,000 Native Americans to “Permanent Indian Territory” in the West. Jackson's speech to Congress in support of the act stressed that removal would allow the tribes to “pursue happiness in their own way and under their own rude institutions” and give the tribes room to develop into an “interesting, civilized, and Christian community.” Jackson also emphasized that the tribes would be financially compensated for the loss of their land and given a year's worth of supplies to support their resettlement. That compensation fell far short of tribal needs and did not take into account that the tribes were being moved from a humid to an arid climate, a difference that challenged traditional tribal agricultural practices. 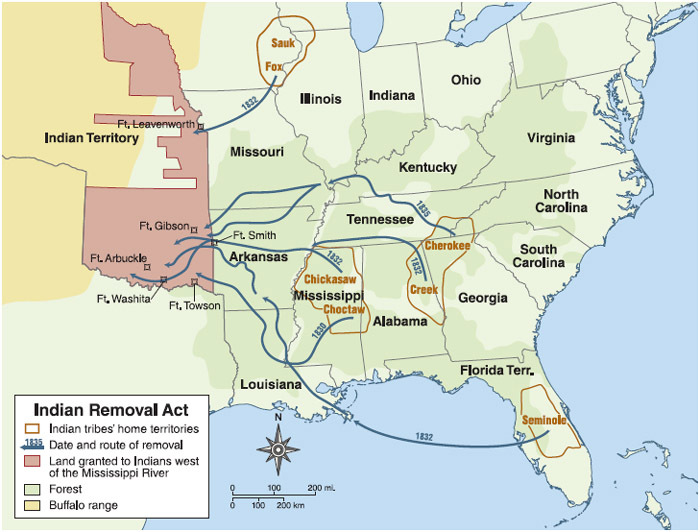 The Indian Removal Act primarily affected five Native American tribes traditionally based in the Southeast: the Creek, Choctaw, Chickasaw, Cherokee, and Seminole. These five tribes were sometimes referred to as the “civilized” tribes by early nineteenth-century whites for the degree to which they had successfully integrated European economic, legal, and cultural practices into their societies. These practices included sedentary farming, the adoption of written constitutions and legal codes, and Christian religious practice. Before 1830, for example, many Choctaws and Creeks had chosen to become citizens of the states of Mississippi and Alabama, respectively. Ironically these efforts at cultural assimilation only exasperated white settlers' attempts to seize Native American land and provoked support for the Indian Removal Act. The act's passage was successfully challenged by the Cherokee tribe in the Supreme Court of the United States, which sided with the tribe and against forcible removal in 1832. President Jackson, however, ignored the court's decision and continued to encourage white seizure of Native American land. He also tacitly endorsed harassment of the Cherokee by federal and state officials until a group of Cherokee peoples—without any tribal leaders—agreed to cede tribal land in Georgia. Congress narrowly ratified this agreement in the Treaty of New Echota in 1835. The Indian Removal Act of 1830 authorized the forced resettlement of Native Americans from their home territories to designated “Indian Territory” west of the Mississippi River. XNR PRODUCTIONS. COPYRIGHT © CENGAGE LEARNING. By 1838 the majority of Cherokee peoples, under the leadership of Chief John Ross, had still refused to leave the Southeast. In response, the U.S. government dispatched 7,000 soldiers to forcibly move the remnants of the Cherokee tribe to present-day Oklahoma. While the soldiers were ostensibly present to assist the Cherokee during the journey, both sides were ill prepared for the harsh conditions of the move. About 4,000 Cherokee—around 20 percent of the tribe's population—died en route to Oklahoma. This tragedy became known as the Cherokee “Trail of Tears” and represents one of the darkest moments in the relations between the U.S. government and Native Americans. Despite the difficulty of their move, the Cherokee tribe eventually prospered in Oklahoma, largely rebuilding their traditional society. The tribe was again forced to move, however, after the passage of the Kansas-Nebraska Act of 1854 and the Homestead Act of 1862. By the late 1840s no major Native American tribes remained in the Southeast outside a small group of Seminole Indians still resisting removal in Florida. The Indian Removal Act had four significant economic outcomes for Native Americans in the early nineteenth century. First, it stated that Native American tribes “claimed and occupied” their traditional lands as opposed to owning them. This proved to be a crucial distinction that increased the federal government's legal ability to seize Native American land. Second, the act declared that the removed tribes would not legally own their new federally assigned Western land as well. While they could supposedly occupy it forever, they were not free to sell it and would lose it if they left it or became “extinct.” Third, while the removed tribes would be compensated for their lost lands, government assessors alone set the compensation amounts, ensuring underpayment. Finally, the removed tribes would no longer hold the economic privileges of sovereign nations in their new Western lands. These outcomes would be modified by the end of the U.S. government's “Permanent Indian Territory” policy in 1862 and the institution of the tribal reservation system still in effect today. Cave, Alfred A. “Abuse of Power: Andrew Jackson and the Indian Removal Act of 1830.” Historian 65.6 (2003): 1330-53. Print. Conn, Steven. History's Shadow: Native Americans and Historical Consciousness in the Nineteenth Century. U of Chicago P Chicago, 2004. Print. “Indian Removal Act of 1830.” Poverty and the Government in America: A Historical Encyclopedia. ABC-CLIO Santa Barbara, 2009. Web. 25 Nov. 2013. “Indian Treaties and the Removal Act of 1830.” U.S. Department of State; Office of the Historian. United States Department of State, 2013. Web. 25 Nov. 2013. “The Indian Removal Act of 1830.” Learn NC. The University of North Carolina at Chapel Hill, 2009. Web. 25 Nov. 2013.